Aliens are real and we can reverse engineer their technology, according to musician-turned-UFO enthusiast Tom DeLonge. Today, the former Blink-182 singer and guitarist officially launched To The Stars Academy (TTA) — a project DeLonge says will not only promote UFO research, but also potentially create working models of alien spacecrafts. He said he has the backing of a team of former CIA agents, military and aerospace officials, plus a molecular biologist. He just needs one thing: your money. “To The Stars Academy of Arts & Science will look to collaborate with global citizens in all efforts to advance science and build a powerful community of interest,” TTA said in a statement. “The company is raising capital from both accredited and unaccredited investors as an alternative to venture capital,” they said. During a press conference launching the company, DeLonge and his team argued the government has secretly covered up numerous encounters with aliens, including technology that could be reverse engineered. “Imagine having 25-century science this century,” said Dr. Hal Puthoff, the group’s science head. 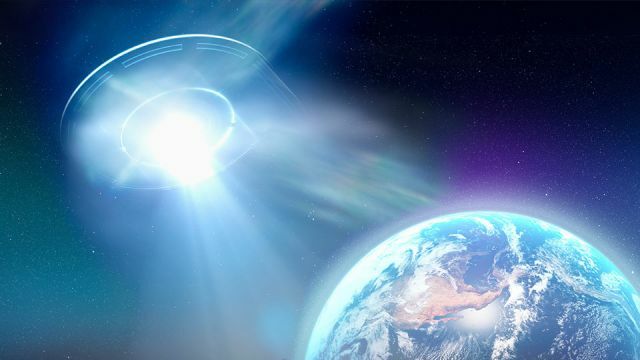 “We’ve mobilized a team of experienced, connected and passionately curious minds to reveal and decode information that can challenge the limits of traditional theory, such as the study of UAP (Unidentified Aerial Phenomenon) technologies,” he said. In other words, we wouldn’t technically be stealing alien technology — we’d just be borrowing their ideas by figuring out how their spaceships work. “It mimics the capabilities observed in Unidentified Aerial Phenomenon by employing a drive system that alters the space-time metric,” he said. Trekkies will also be delighted to hear TTA even dropped a hint that they could be looking at warp drive technology — which could be a real life-saver next time you find yourself behind Borg lines in the far reaches of the Delta Quadrant. Now, the government’s secrets are out. “To The Stars Academy of Arts & Science has mobilized a team of the most experienced, connected and passionately curious minds from the US intelligence community, including the CIA and Department of Defense, that have been operating under the shadows of top-secrecy for decades,” his organization stated on its website. TTA claims to include among its ranks a former deputy secretary of defense, a former CIA intelligence officer and a former advanced systems director for aerospace firm Lockheed Martin’s “Skunk Works” project. The project is an advanced development program responsible for a handful of well-known aircraft designs such as the F-22, and has long been a popular topic for conspiracy theorists. DeLonge has previously stated he created TTA to jump-start renewed public debate around extraterrestrials, though his personal interest in aliens go back as far as his Blink-182 days. Since parting ways with Blink-182 under controversial circumstances in 2016, DeLonge’s interest has ballooned. “I couldn’t tell the band I was working with people in the government,” he told Rolling Stone last year. He even says there are plenty of people in high places that share his passion. “I have ten people that I’m working with that are at the highest levels of the Department of Defense and NASA and the military,” he said. However, it’s not just former government officials who share DeLonge’s views, with belief in aliens becoming increasingly mainstream. In another interview with Paper Magazine a year earlier, DeLonge opened up about how his interest has gone from a fringe conspiracy theory to something he feels comfortable discussing in police company. “What’s funny, two decades ago when I got into this, it was such a ‘the world is flat’ scenario, and here’s Tom running around about UFOs and they’d just laugh it off,” he said, reminiscing of a time when his ideas were more often than not laughed off by detractors. “But now, NASA is holding symposiums on the inevitability of finding life in the universe. The Vatican is talking about, yes, there’s life out there, and how it interferes or doesn’t interfere with the church’s view of existence,” he said. Indeed, DeLonge is far from alone in believing in aliens. A 2012 study from the National Geographic Channel found 80 million Americans — roughly a third of the population — believe in aliens. Jjust 17 percent flatly state they don’t think extraterrestrials exist. The same study also found a whopping 48 percent of Americans are undecided on the matter. Similar international studies suggest America’s believers are far from alone in the universe — at least in terms of other believers across the globe. A 2015 poll by YouGov found over half the population of the U.K. believes in aliens. However, the most alien-infatuated country they found was Germany, where 56 percent of respondents said they think aliens exist. What about you? Do you believe in aliens, and do you think we can reverse engineer their cool stuff? Hey Buddy!, I found this information for you: "Aliens Exist And We Can Steal Their Stuff, Says Former Blink-182 Singer Tom Delonge". Here is the website link: https://www.thealternativedaily.com/aliens-exist-can-steal-stuff-says-former-blink-182-singer-tom-delonge/. Thank you.